The bane of many a fishkeeper, algae is the cause of many people giving up the hobby. Jeremy Gay offers pointers on why you may have it â€” and how to control and get rid of it. Algae is everywhere. There are algaes adapted to hot water, cool water, hard water, soft water, freshwater, seawater, bright water, and poorly lit water. It will grow wherever there is light plus water – and our fish tanks provide perfect conditions. But why? Algae needs light to thrive and our fixed duration lighting is perfect. With no plants or corals in the aquarium, cut the light back to a few hours per day when you are viewing it. 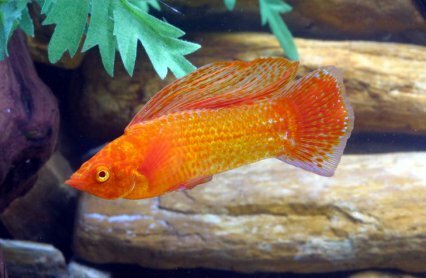 Fish actually prefer lower lighting conditions, will feel more secure and your nocturnal fish may become more active in the daytime in low light. Cut lighting to four hours a day, or less and the algae will struggle. Cichlids show particularly good colour in dim, ambient room light. One method popular with some plant growers is the ‘siesta’ whereby lights are turned off for an hour or two in the middle of the day. This interrupts algae growth, but plants can put up with it. Ensure no sunlight reaches the tank as algae will grow fiercely when exposed to it. Take this into account when initially placing the tank. If some exposure is unavoidable, stick backing paper to the sides to try and block it out — or use an internal structured background. The subject of which nutrients actually fuel algae growth is hotly contested. Some say that nitrate and phosphate cause algae; others claim that ammonia is the cause. Although nitrate and phosphate can be used as fertilisers in heavily planted tanks, in a tank with little or no plants, or any marine tank, it will fuel algae growth. Phosphate can also impair coral growth in seawater. Take readings of both nitrate and phosphate levels with test kits and then do your utmost to eradicate it. Do plenty of water changes to bring levels down, but only if your source of water is significantly lower anyway, so again test. A guaranteed way of obtaining a supply of water with negligible amounts of algae-causing fertilisers is to use reverse osmosis (RO) water or deionised water. Purified water is one of the most popular algae controls, as are nitrate and phosphate removal resins — and a combination of both purified water and phosphate removal resin used long term will go a long way. And, if algae is still present, test for silicates and try to eradicate them. Deionisers remove silicates. There are natural ways of removing nitrates and phosphates from both fresh and seawater. Aquatic plants will take them up as they grow, so heavy planting will normally get rid of it. Some plants are even said to inhibit algae growth by releasing chemicals, though heavy planting is much more reliable. Plants will use up all available nitrates and phosphates in aquarium water, as well as trace elements and macros that would normally also feed algae. However, once they have used them up, the plants will go hungry too and need feeding in their own right. Marine 'plants' can also be used for the same purpose. Macro algaes like Caulerpa, kelp and seaweeds are higher forms of algae that we find desirable and, although not as advanced as true plants, they use nutrients in the same way. A refugium is another tank connected to a marine tank and used to harbour macro algaes and useful invertebrates that would otherwise be eaten by fish in the main tank. Tank water flows through the refugium, the macro algae is supplied with light for growth and it consumes the nutrients as it grows, removing them from the water column and making conditions more to the liking of corals. Macro algaes are also known to fight nuisance algae by outcompeting them, releasing chemicals to retard them and growing in areas where the stuff would otherwise be growing. Don’t put too much in the main marine tank however, as it can also grow over and outcompete corals — and not too many fish, even the herbivores, can control a tank full of macro algae. It is said that every living thing contains phosphate — even being present in rocks and gravels. Fish produce phosphate and it is also in their foods. More fish and over feeding will cause more phosphate and nitrate from the filtering processes and, with nothing in the tank to take up either of them, they will feed algae. Compare the analysis on the back of the food tub as some brands will have lower phosphate levels than others. Feed less, remove uneaten food — and rinse frozen food as the juice in the frozen cube is incredibly high in phosphate. Big, messy fish will produce more phosphate than small ones and bigger, dirtier filters filled with gunge will harbour more phosphate and nitrate. Run a lean, tidy tank. Where would be without our algae grazing plecs in tropical tanks, or our tangs in marine tanks? Smothered with more algae is the answer. Lots of fish graze algae, including a few you wouldn’t normally consider, like mollies. Then there are ever growing numbers of inverts. In freshwater use snails and algae eating shrimp as well as algae grazing fish. In the marine tank use tangs, angels, algae blennies, snails, urchins, Hermit crabs and Mithrax crabs to deal with the myriad of marine algaes. Opinion is again hotly divided among algae battlers. Some believe that high flow causes algae to grow while others feel that high flow and high circulation help to hold it back. Both parties may have a valid point, though it would appear that strong flow can cause ‘tearing’ of slime algaes and cyanobacteria and that alternating flow can also disrupt its growth and spread — and help to dislodge it from surfaces. The only way to find out whether increased or decreased flow is best for you is by experimenting. The most effective way to wage war on algae is to attack it on several fronts. Lessen the duration of your lighting, switch to RO water, clean the tank more and add a selection of algae grazers. Then you will significantly lessen its stranglehold and maybe even beat it altogether! Make sure lighting is matched to livestock and is replaced regularly with new bulbs/tubes to keep the wavelength constant. Blue lighting can cause excess algae in freshwater and low Kelvin lighting, peaking in the red, can encourage algae in marine aquaria. Bulbs and tubes degrade over time, lowering their Kelvin rating, possibly causing more algae and producing light less useable by plants or corals.